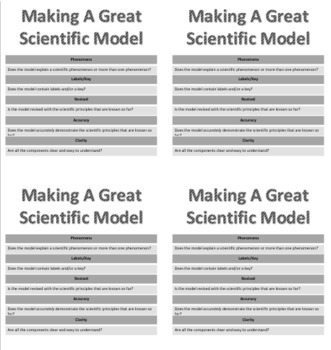 This resource is for students to assess their scientific models in order to make sure they are accurate. The NGSS require students to be able to demonstrate and communicate their understanding of scientific phenomena by creating models. This will help students critique their own work before presenting it or handing it in for a grade. Students can also use it to give feedback to their peers. You can laminate it and it will last a while. I made one large copy and smaller copies so they can paste in a notebook. I hope this is helpful. Please rate and/or leave feedback! Thank you!